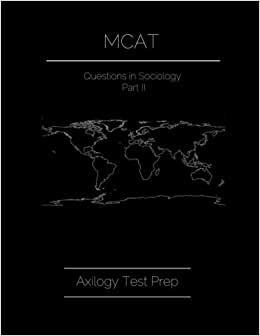 Hundreds of MCAT questions to understand and refine concepts and terms in sociology for better comprehension. Research analysis in sociology included. This book is a waste of money. There are existing resources that are online AND free that are a better use of your time. Answer reasonings are not provided for half of the questions. Only answer choices would be provided, which is not sufficient! Great book for reviewing sociology! It has a lot of material I didn't even know existed and haven't found in Kaplan and TPR yet. The questions are not exactly like the MCAT but they are amazing to review concepts. There is a lot of research questions in it which helps make passages in the AAMC banks that have tables easier to read. It's really hard to find a resource to address the Sociology section of the MCAT, do you this resource as it is very helpful and accessible! Get this ASAP to help prepare for the MCAT exam. Definitely a more challenging set of questions for those looking for advanced MCAT practice. I felt as though this book touched the AAMC recommended material. Highly recommend!